Bernie (2012 PG-13) is a comedy based on a true story of a funeral director who takes up with a much-hated wealthy widow in the small east Texas town of Carthage. She becomes possessive to the point where he loses his sweet nature, kills her, then goes to great lengths to create the illusion that she’s still alive. Don’t confuse this film title with the classic comedy Weekend at Bernie’s, released in 1989. Assistant funeral director Bernie Tiede is played by Jack Black and Shirley McLaine portrays wealthy widow Marjorie Nugent. Bernie derives much of its charm from the commentary of the townsfolk who think he’s the bee’s knees, especially the little old ladies who say he does hair really well. After shooting her four times in the back, Tiede stuffs her in a freezer with the idea that he’ll give her a proper funeral later. Her frozen body stays there for nine months while Bernie spends a big chunk of her fortune, millions of dollars, on assorted good deeds and indulgences, buying the people of Carthage pretty much whatever they want and pledging a new wing for the Methodist church with hardly anyone bothering to ask where he got so much money. Two elements make Bernie an eye-opener about funerals: tricks of the trade for making up corpses and the way Bernie steers a couple toward buying a higher-priced casket. The film opens with Bernie Tiede being introduced to mortuary school students at his alma mater, McNee State, where he got his associates degree in mortuary science. He proceeds to give them a lesson on corpse cosmetology, which includes the finer points of nail clipping, hair trimming, make-up tips, and the judicious use of Super Glue to keep eyes and mouths closed. In the next scene, Bernie steers a couple away from cremation, saying, “I just don’t like the idea of someone spending eternity in something the size of a motel ice bucket.” When a tall elderly man expresses interest in the cheap cloth-covered casket, Bernie mentions that those are used by the county for indigent burials and “these economy boxes aren’t very large and we may have to make a leg adjustment to get a proper fit.” The wife doesn’t want any “leg adjustments” and Bernie steers them toward the noble (and pricier) Corinthian model. The story is based on a 5,564-word article that Skip Hollandsworth wrote for the January 1998 issue of Texas Monthly. Its title, “Midnight in the Garden of Good and Evil in East Texas,” was a play on John Berendt’s 1994 nonfiction book, “Midnight in the Garden of Good and Evil,” about a killing in Savannah, Ga. Even after the body is discovered and Bernie confesses to the crime, a lot of people in Carthage are so sure he couldn’t have done it (“Bernie? Dear, sweet Bernie?”) that the district attorney (played by Matthew McConaughey) has to move the trial two counties south just to find a jury that’s willing to convict him. It’s a story about people believing what they want to believe, even when there’s evidence to the contrary. It’s a story about people not being what they seem. And it’s a story, as the movie poster says, “so unbelievable it must be true”. Which it is. I know this because the widow in the freezer was, in real life, my Aunt Marge, Mrs Marjorie Nugent, my mother’s sister and, depending on whom you ask, the meanest woman in east Texas. She was 81 when she was murdered, and Bernie Tiede, her constant companion and rumored paramour, was 38. He’ll be eligible for parole in 2027, when he’ll be 69. There are little things in Bernie that aren’t exactly true, bits of dialogue, a changed name here and there. But the big things, the weirdest things, the things you’d assume would have to be made up, happened exactly as the movie says they did. The trial lawyers really did wear Stetsons and cowboy boots and really were named Danny Buck Davidson and Scrappy Holmes. And they really did find my Aunt Marge on top of the flounder and under the Marie Callender’s chicken pot pies. They had to wait two days to do the autopsy. It took her that long to thaw. I was living in Los Angeles when Aunt Marge was murdered in 1996 and hadn’t been to Carthage, where I was born, in quite a few years. I went back for the trial in 1998 because, let’s face it, it’s not often that someone in your family becomes the focus of a sensational murder case. And there was something about Aunt Marge ending up in a freezer that seemed appropriate. She’d always been kind of coldhearted. It was not an unfitting end. Right now, Tiede is serving a life sentence in the Telford Prison Unit in New Boston, Texas. That’s about 100 miles north of Carthage. Jack Black visited with him to observe his mannerisms, and both he and Shirley MacLaine asked about little details to make sure they got everything right. Bernie is available through Netflix and on Amazon.com (as available). It’s a fun film – check it out! 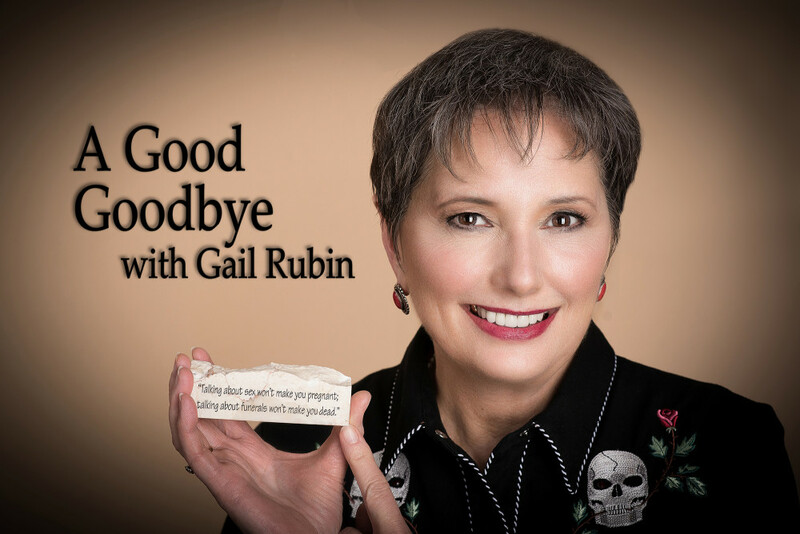 Gail Rubin, The Doyenne of Death, is author of the award-winning book, A Good Goodbye: Funeral Planning for Those Who Don’t Plan to Die. She speaks to groups using clips from funny films to illustrate funeral planning issues and help start serious conversations. Her website is www.AGoodGoodbye.com.